From the Star Wars The Last Jedi collection by Hasbro. Star Wars The Last Jedi 3.75 Inch Action Figure 2-Packs Wave 1 Case. From the Star Wars The Last Jedi collection by Hasbro. 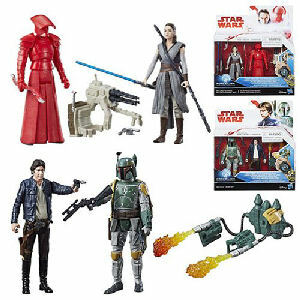 Star Wars The Last Jedi 3.75 Inch Action Figure 2-Packs Wave 1 Case. Case contains 8 individually packaged action figure 2-packs - 4 Han Solo with Boba Fett 4 - Rey (Jedi Training) with Rey (Entrainement Jedi) Action figures measure 3.75 inches tall.